Dog Booties Made From 1000 Cordura Lined or unlined available. These are hand crafted durable dog booties. Dog booties come in all sizes and lots of different colors to choose from. They are made with durable Cordura and flannel. They are great paw protectors for your pet. Dog owners have searched for years for a dog boot that protects their dog's feet and their floor's surfaces, while being warm, functional, and staying in place during wear. At Comfy Dog Boots & Shoes we are dog people. We have created dog boots that are protective of your dog's feet from all of mother nature's attacks on tender paws and pads. Your dog deserves the same quality of footwear that you put on the other members of your family. At Comfy Dog Boots & Shoes we know that and have you and your dog's comfort in mind. Our Comfy Dog Boots are hand made in the USA (by me in my home)! They are protective footwear for your stylish dog's tender paws in any weather conditions or while they are inside or outside playing and having a great time. Our dog booties and shoes, or protective dog footwear, are designed with your pet's safety and comfort in mind from the velcro closures to the non-slip rubber bottoms. Our Comfy Dog Boots & Shoes are made to protect & insulate a substantial portion of the feet, pads, joints, & muscles of the leg and also stay on while your dog runs, plays, jumps, & takes care of his or her business! Our Comfy Dog Boots & Shoes are durable, comfy, stylish & capable of protecting your dog's tender feet & legs from harsh environmental stresses including: Freezing Snow, Blistering Ice, Prickly Burs, Stabbing Thorns, Scorching Hot Cement, Blazing Sand, Cold Brisk Weather, Harsh Terrain, Unwanted Moisture, Bothersome Cold Mud, Grainy Rock Salt, & Harmful Chemical De-icers and all of mother nature's attacks on tender paws and pads! All of these harsh environmental elements can irritate a dog's paws & turn a pleasant walk into a painful ordeal. 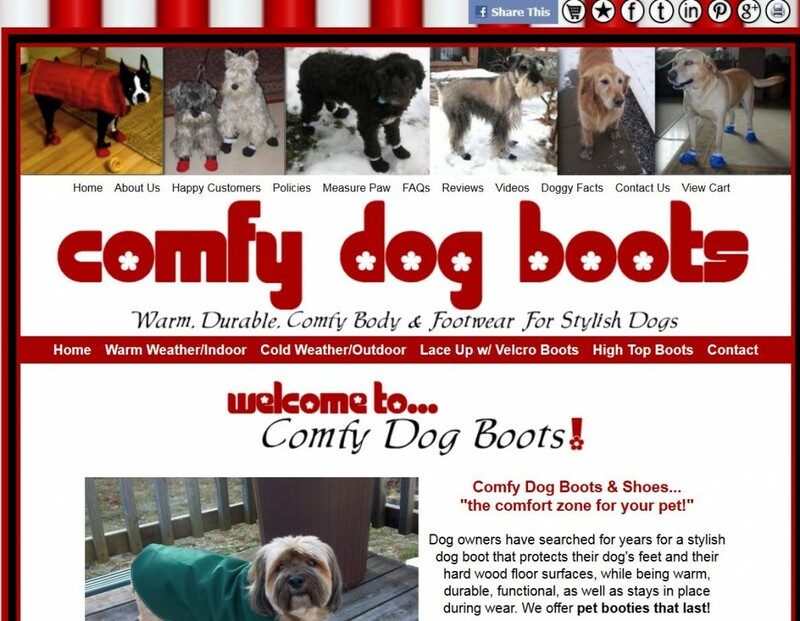 Comfy Dog Boots & Shoes has you and your dog covered. The Non-slip rubber bottom is also great for inside on hard wood floors and slippery surfaces.